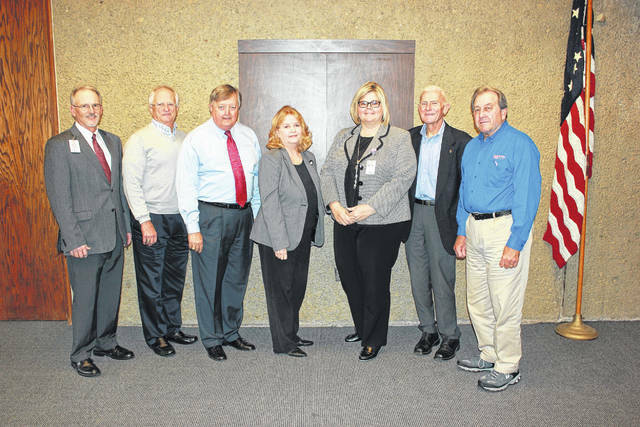 Pictured left to right are Mike Canady, CEO, Holzer Health System; Jim Morrison, outgoing President; John Jones, President-Elect; Linda Jeffers-Lester, Foundation Manager, Amee Rees, Community Fundraising Manager; Greg Ervin, Director and Mike Northup, Secretary-Treasurer. Not pictured Shayna Chapman, Vice President. GALLIPOLIS — Newly elected officers and directors were announced at the annual meeting of the Board of Directors of Holzer Heritage Foundation. “Jim Morrison, a member since 2003, was honored for outstanding leadership as President from 2008 to 2017,” said Linda Lester. Other Holzer Heritage Foundation Directors are Dr. Robert Bradley; Marianne Campbell; Stan Evans; Mike Hayes, Chief Financial Officer, Holzer Health System; Bob Hood; Tom Karr; Dr. April Magnussen, Dr. Wayne Munro and Dr. Choudhary Rayani. Also, John Stevens; Ron Toler; Dan Waugh; Jimmy Wiseman and Gene Wood. Staff members serving are Dr. Mike Canady and Debbie Caldwell. Established in 1977 and overseen by a board of directors composed of local community citizens, Holzer Heritage Foundation is a 501(c)(3) non-profit organization that secures charitable gifts for programs and services provided by Holzer Health System. For more information about Holzer Heritage Foundation, please call Linda Jeffers-Lester at (740) 446-5217.